My second day wasn’t so successful at Edinburgh Printmakers, but making mistakes teaches you more. 2/? Day two in my latest stone Lithography project, and after yesterday’s grinding of the stone and sketching of the two images, today I etched for printing. Having noted the sky’s in both of my drawings were too dark I wanted to etch away some of the darker parts before adding the ink. Unfortunately I over etched and when it came to the print some of the areas were washed out, not dark enough and missing the contrast I was looking for. All is not lost though and the experts at EP showed me a few techniques to scrap back the over etch and add more greasy drawing to hopefully add contrast. The stones are now resting until I can arrange another session to try another print from the new etch. Not easy and a lot of ups and downs, and experimentation to come but I’m enjoying learning more about the process each time I am in the studio. 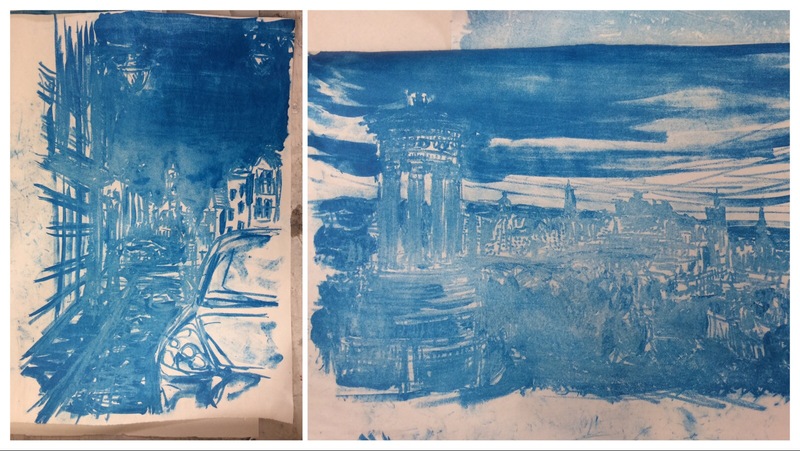 Book an evening class and find a passion for creating art at Edinburgh Printmakers, see more at there website HERE.